The Community Yard Sale is a huge twice-a-year event in our neighborhood. If you like yard sales, ours is considered “Yard Sale Heaven.” Forty to fifty families normally participate; as a result, there are thousands of things for sale. And . . . guess who is in charge of organizing it? As we all know, it has been a long cold winter . . . however, the weather last Saturday turned out to be very inviting . . . chilly, but blue skies. Potential buyers came by the hundreds. Participants and treasure seekers alike were ready to be outside . . . engaging with neighbors and strangers . . . looking for the next great bargain. As I handed out flyers in the morning — I discovered people came to our event from as far away as Wilksboro, Hickory, Salisbury, Charlotte, Greensboro, South Carolina and one carload of eager buyers came from Virginia. My goodness! The word has spread — if you enjoy YARD SALES . . . our neighborhood is the place to be. As I was cleaning my house and purging for the sale (NOTE: I don’t participate — but I let others use my yard and then I put a few things out too) Anyway . . . I ran across a ton of old movies on VHS and DVD. 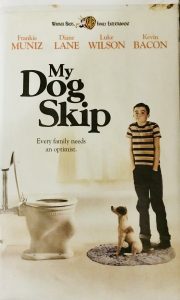 “My Dog Skip” was among the collection. My anecdote . . .
For those parents who have experienced the transition when they take their child to college . . . this one’s for you! So — home I went with rented movie in hand. This is one of those unforgettable, monumental parenting moments that Roger and I hold dear to our hearts. I honestly do not remember the details of that movie — but I will never forget the expression on my son’s face. And for that reason — “My Dog Skip” was eventually purchased for our movie collection — and I can’t part with it. Do you go to yard sales? Have you ever hosted one? If so, have you ever put an item out to sell and snatched it back before a stranger could buy it? Even worse . . . have you ever sold an item that evokes precious memories and instantly regretted it?